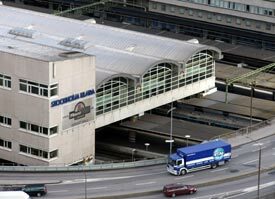 ABOVE: Stockholm has its share of ugly highways, but you can avoid them by relying on your feet and public transportation. Stockholm is an easier city to drive in than many European capitals, since traffic is relatively light (even at rush hour) and drivers tend to be civilized. However, with fuel and parking being expensive, why bother? My suggestion: Dump your rental car when you arrive in Stockholm and use the city's clean, comfortable, crime-free public transit system. If you must drive, be careful to obey the laws and show respect for pedestrians. Whatever you do, don't drink and drive: If you're caught, you'll go to jail. Stockholm has parking garages and street parking, the latter often regulated by machines that issue tickets in return for a coins or a swipe of your credit card. These vary in design, but most accept credit cards, debit (check) cards, or cash. After you've obtained a ticket, stick it inside the windshield of your car where the parking warden can see it.